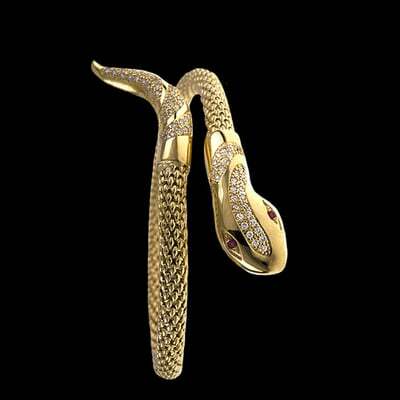 Exotic 14k Yellow gold polished Snake bangle bracelet. Incredible Italian crafted bangle features a hinge for easy wear. Bangle measures 3mm in width and weighs about 7.22grams. An exciting bangle brilliantly crafted. Part of our Lifetime Guarantee collection. If anything happens to this bracelet (other then you loose it) we replace it!!!! Stunning 14k Polished Gold Lion's Head bangle bracelet. This bracelet is created in Italy and measures 6.75 inches. Lion's head measures 25mm in length by 13.4mm wide. Bracelet is 3mm wide. Bracelet weighs 6.72 grams and is part of our Lifetime Guarantee collection. If anything happens to this bracelet (other then you loose it) we replace it!!!! Tri-Color Textured & Polished bangle bracelet. Italian made 14k Gold Rose, Yellow, and White gold are intertwined to create this amazing slip on bangle bracelet. Bracelet weighs an incredible 9.43grams and is part of our Lifetime Guarantee collection. If anything happens to this bracelet (other then you loose it) we replace it!!!! 14k Gold polished cuff bangle bracelet. Another beautiful Italian crafted bangle features a White Rhodium mesh that shows through 14k gold open design. Unique bangle is 15mm in width and hollow. Bracelet weighs 11.4grams. 14k Two Tone Gold Twisted hinged bangle bracelet. 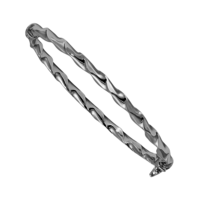 Gorgeous Italian crafted bypass style bracelet weighs 14.34grams. Bangle bracelet is a slip on design and measures 4.5mm in width. Bracelet is solid. 14k Two Tone Gold hinged bangle bracelet. Delightful two tone design measures 5mm wide bangle bracelet. White section of this bracelet is Rhodium plated. Italian Made design weighs 12.47 grams. Bracelet is secured with hidden clasp and is a hinged style bangle. Lovely 14k Gold Polish & Textured bangle bracelet. 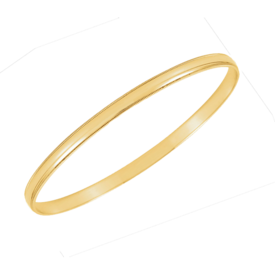 An Italian crafted 4mm wide grooved design bangle available in 14k Yellow, Rose, or White gold. This bangle is hollow. Bracelet features a hinged center and fold over catch. Gold bangle bracelet is part of our Lifetime Guarantee collection. Exciting 14k Gold and diamond bangle. 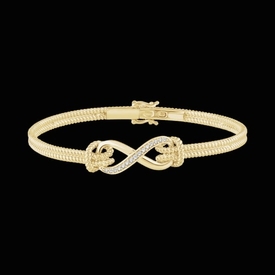 This dual rope design 14k gold features an Infinity feature center accented with 1/8ctw diamonds. Available in 14k Yellow, Rose, or White gold. This stylish new design will look great at elegant evening events, cruising on the bay or a weekend wine tasting. Bracelet weighs 15.89grams and measures 9.6mm wide. Secured with a box clasp and is a 7 1/2 bracelet. Fun 14k Yellow gold Infinity cuff bangle. This polished Infinity bangle is a flexible cuff design. An Italian made bangle weighs about 3.73grams. Gold bracelet is part of our Lifetime Guarantee collection. 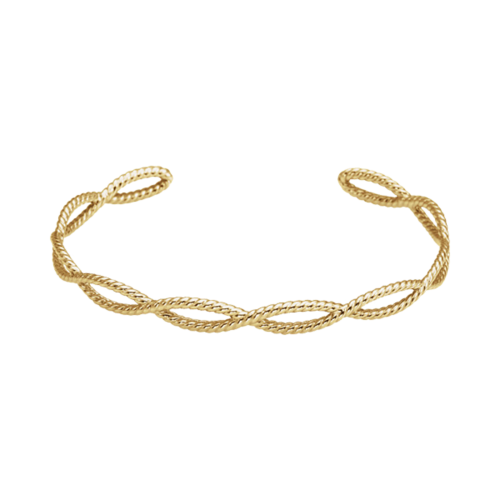 Incredible Italian made 14k Yellow gold twisted bangle bracelet. This bangle measures 8mm wide and 7 inches around. Features a hidden clasp with a safety catch. At 11.5 grams this is a gorgeous bracelet. Part of our Lifetime Guarantee collection. 14k White gold twisted hinged bangle. This Italian made bangle weighs about 5.51grams. This beautiful gold bangle bracelet is part of our Lifetime Guarantee collection . Classic 14k Yellow or White gold bangle bracelet. Wardrobe staple available in a 2mm, 4mm, 6mm, and fabulous 8mm wide selections. 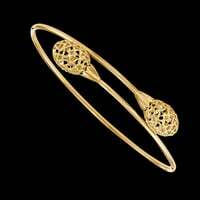 Gold bangle bracelet is a very comfortable half round design. Bracelets fit is a 7 1/2 inch size and slips on. Gold Milgrain Edge bangle bracelet. 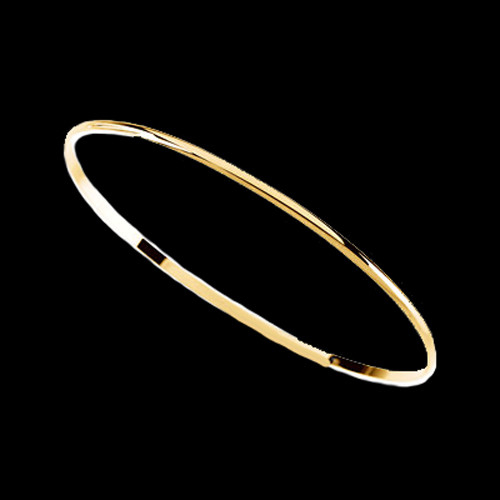 14k Yellow gold 4mm wide bangle bracelet. 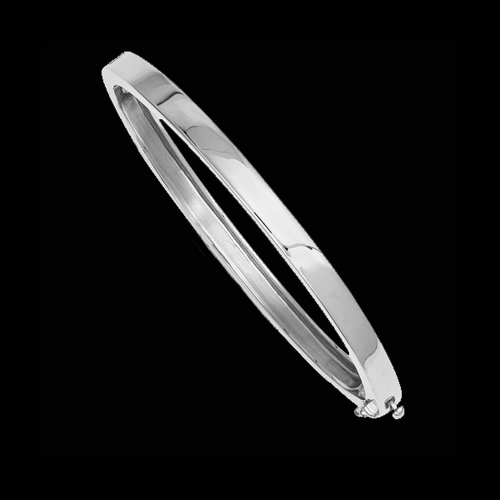 This bangle features a milgrain border either side and weighs 10.68grams. This 14k gold bangle bracelet measures 7 1/2 inches. Lovely 14k gold diamond circle hinged bangle bracelet. Diamonds total 1 /6ctw in this pretty bracelet and it's available in 14k white, yellow, or rose gold. Bracelet weighs 8.35grams. This diamond bangle bracelet measures 7 inches. 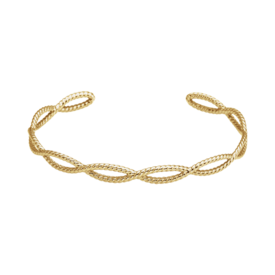 14k yellow gold Rope cuff bracelet. Bracelet measures 60mm wide and weighs about 9.25grams. Check out our video for a better view. Bracelet is available in 14k yellow or white gold, or Sterling Silver. Stunning 14k yellow or white gold solid design bangle bracelet. 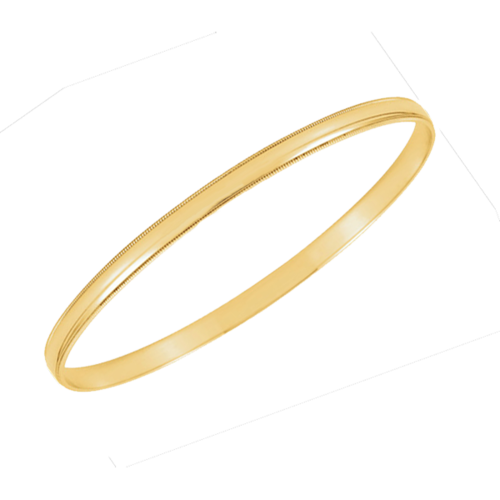 This bangle measures 5.3mm in width by 6 1/2 inches oval. Beautiful simple design is hinged and weighs about 24.03grams. Features include a safety clasp, hinged design, and polished finish. Bracelet has an open back. 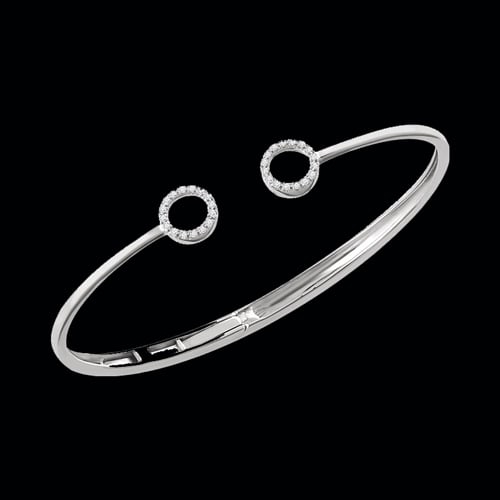 Spoil yourself with our finely crafted bangle bracelet. Stunning 14k yellow or white gold cuff bracelet. You'll love this incredible design, it transcends time yet is unique enough that you'll be the only one wearing it. 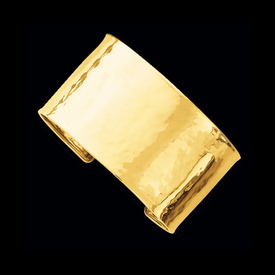 Our gold cuff bracelet features a lightly hammered finish and measures and incredible 37mm wide. This Italian made cuff bracelet weighs about 38.25grams. Gorgeous 18kt yellow gold diamond snake cuff bracelet. An incredible bracelet from the tip of his nose to the end of his tail. Diamond accents total .38ctw and Ruby eyes complete the design. You'll love this exotic bracelet. 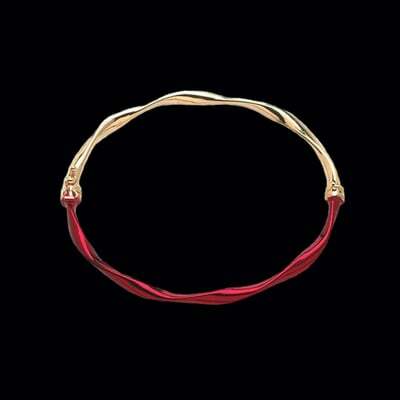 Stunning 14k yellow and red gold bangle bracelet. This exciting new bracelet design is 14k gold and half of the bracelet features a brilliant rich red color that is baked into the gold, not an enamel and will not come off. This bracelet is part of our lifetime guarantee line and if for any reason this bangle breaks or the color distorts we'll replace it FREE, you just pay the shipping to get it here. Bangle bracelet weighs approx.. 4.8grams and is secured with a box catch and safety clasp. Such a beautiful bangle with a slight twist. The tradition of wearing bangles began in ancient India, Pakistan, and Bangladesh. By definition, bangles are rigid bracelets, usually made of metal, wood, or plastic. As an ornamental jewelry, bangles may also come with diamonds, gems, and pearls. However, due to contemporary manufacturing of this jewelry, it is tough to tell authentic gold bangles from phony imitations. Bangles have a strong tie to marriage in South Asian cultures. It is a custom where a bride must wear as many bangles as possible at her wedding. The act of wearing multiple glass bangles is a honeymoon ritual in India, Pakistan, and Bangladesh, where the breaking of the last bangle represented consummation. The value of bangles in Hinduism is much greater than in any other religion because they denote auspicial significance for marrying women. Toddlers and women may also wear regular bangles in gold and silver; men may wear a single bangle, made only out of gold, silver, or iron. Today, bangles exist in many gold variants, such as rose gold, which is an excellent gift for that special someone. The design of bangle jewelry hasn't drastically changed compared to other jewelry types, such as earrings and rings. The circular shape of bangles is still intact, although modern construction materials have taken over. The term bangle comes from the Hindi word "Bungri," meaning glass. Bangles often come with precious metals such as gold, silver, or platinum, although cheaper materials are prevalent. Other creative construction materials include wood, glass, plastic, seashell, and fern. For those without the means to travel the world (isn't that nearly all of us? ), GraciousRose.com offers the most extensive collection of jewelry online. Whether you need gold, platinum, white gold, or rose gold bangle jewelry, we have you covered. With over 3,500 exquisite handmade jewelry pieces to consider, you are sure to find the best bangle from the comfort of your home! Buy the finest bangle jewelry to give to your loved one today! Along with free shipping on orders over $250, Gracious Rose also offers designer and custom jewelry to suit all your needs. Consult one of our Jewelry Consultants for expert advice on buying our ethically sourced and environment- friendly bangles!